I've looked at SchoolhouseTeachers.com several times over the last few years and have considered signing up for a membership but just never took the plunge. As a member of The Old Schoolhouse Homeschool Review Crew I was recently given the opportunity to review a Yearly Membership with SchoolhouseTeachers.com. Wow! Now that we've had a few weeks to get a feel for the site and all that it has to offer, I'm kicking myself for not joining sooner! The new SchoolhouseTeachers.com website is amazing! It is easy to use and navigate. 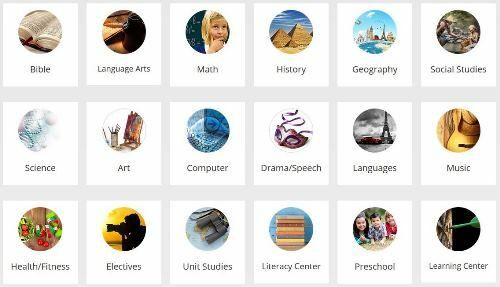 They offer Online Classes and Online Electives to use in your homeschool, either as your full curriculum or as a supplement to what you are already using. There are Scope and Sequence charts, lesson plans, and printable certificates of completion. Homeschooling children of multiple ages? No problem! They have course work for students preschool - high school. We have used several of their history lessons while studying the Renaissance. There are weekly lesson plans, lapbooks, notebooking pages, as well as links to videos and related maps as well as hands-on activities like games, recipes, and crafts to really bring the Renaissance to life for my kids. In addition to the courses, we have also enjoyed some of the special online access to products included in our membership like The World of Animals through the World Book eBook Library and learning about how Christopher Columbus discovered American through watching the amazing video series called Drive-Thru History. These have been so much fun for my kids to explore! In addition to the wealth of curriculum on the site, there is also an abundance of homeschool parent support resources on the site. As a member you can download several different planners. Here are just two of them which are for homeschool parents to help organize their homeschool as well as manage their home. However, they also offer primary, intermediate, and high school student planners, as well as a planner for special needs students. There is also a Custom Schedule Builder to help you organize your homeschool day as well as online access to Applecore Recordkeeping for tracking your students' portfolio, coursework, grades, and attendance. 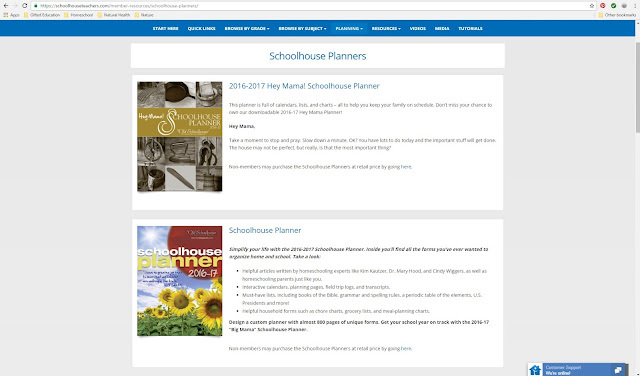 SchoolhouseTeachers.com really has everything you might need for your homeschool! 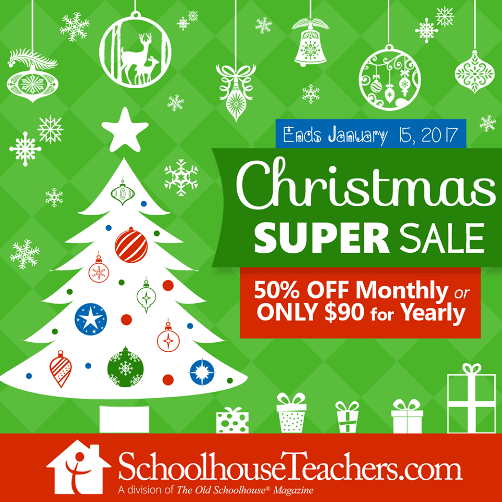 Be sure to join SchoolhouseTeachers.com during their Super Christmas Sale and save 50% by using code: CHRISTMAS for $9.95/month or CHRISTMASYEAR for $90/year. This is really a great deal! The sale ends on January 15th so HURRY and lock in your promo rate. My kids and I have thoroughly enjoyed using SchoolhouseTeachers.com in our homeschool and I have written my honest opinion about this product. Although I was given a free Yearly Membership in order to research the product and write this review, I have benefited so much from it that I will definitely renew our membership when this one expires.